Jurors were riveted as Elizabeth Smart told her story, spending three days on the witness stand. 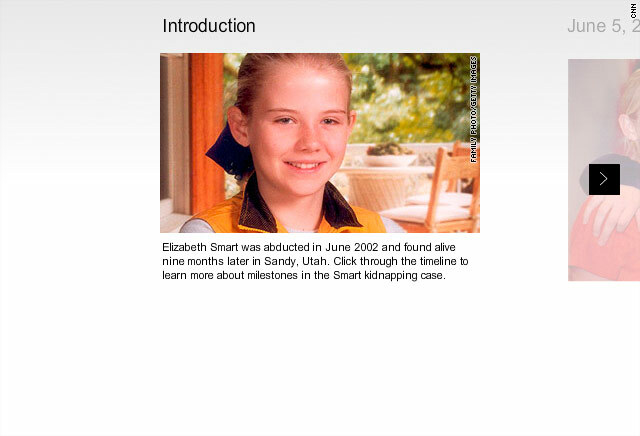 Salt Lake City, Utah (CNN) -- Maybe Elizabeth Smart wouldn't have spent "nine months in hell" if her mother hadn't burned the potatoes. Maybe she wouldn't have been stolen in the night if she and her father had closed the kitchen window and set the alarm as they made their nightly rounds after family prayers. And maybe her ordeal wouldn't have lasted so long if somebody -- anybody -- had just spoken up after seeing a veiled teenager who didn't seem to have a will of her own. There are so many maybes in Elizabeth Smart's story. They're the kind that arise only in retrospect, when bad things happen to people who never had a reason to expect them. Witnesses who testified for the prosecution at the federal trial of the homeless street preacher accused of kidnapping the 14-year-old Utah teen told a heartbreaking story of what ifs and near misses. There was the cop who didn't lift Smart's veil at the public library; the passersby who noticed an odd-looking trio walking the streets in their religious robes but didn't inquire further; the message for help Elizabeth scrawled in the restroom stall. And there were people who encountered the girl and her abductor at parties or invited them into their homes while Smart's poster was plastered on storefronts and her alleged abduction dominated headlines. And there was Smart herself, who told the jury how she became angry at herself when fear forced her into silence. "To hear testimony from so many who said their gut told them one thing, but either a call to law enforcement wasn't made, or a call that was made wasn't followed up, puts the issue here front and center," said Jean Casarez, who is covering the trial for "In Session" on CNN's sister network, truTV. "This case teaches us not to make snap judgments -- any time, any place," Casarez said, quoting Lee Benson, author of a book about the Smart case. As Smart was made the unwilling child bride of a man she said raped her, drank, talked about himself incessantly and smelled foul, she mourned her lost childhood and doubted her own worth. "I felt that because of what he had done to me, I was marked," Smart testified. "I wasn't the same. My personal value had dropped. I was nothing. Another person could never love me." The story begins with a panhandler at the mall who got $5 from Smart's mother and allegedly determined that he'd make the blonde teenager with the blazing blue eyes his own. Burned potatoes gave him an opening, according to testimony. Lois Smart thought it would be nice to cook a family dinner on the night of Elizabeth's junior high school awards ceremony. But, she said, she burned the potatoes and opened the kitchen window to clear the smoke. The family attended the awards ceremony, and Elizabeth brought home several honors, including one for physical fitness. She showed an aptitude for track, and had taken up running. That evening, the family prayed together, as they did every night, and Elizabeth and her father checked the windows and the doors before everyone went to bed. The kitchen still smelled of burned food, so they decided to leave it open. The family seldom set the security alarm. Usually, Smart testified, the doors beeped any time someone opened them. But she noticed that night that the back door wasn't beeping. The Smarts learned later that a magnet had slipped, silencing the door. Smart read to her little sister late into the night, from the book "Ella Enchanted." Sometime before dawn, prosecutors allege, Brian David Mitchell used a wrought iron chair as a stepladder and sliced through the screen of the open kitchen window with a knife. Elizabeth awoke to the sound of a man's voice and felt a cold, sharp metal blade against her throat. She was led to a makeshift camp in the steep canyons above her family's home, where Mitchell's wife, Wanda Barzee, awaited them. Mitchell "sealed" Smart to him in a brief ceremony and raped her, she said. He told her she'd learn to love it. She was tethered between two trees for a month. When she heard people in the woods calling her name, she was paralyzed with fear and didn't respond. Mitchell had threatened to kill her and her family if she called out or tried to escape. Once, she tried to run as Mitchell and Barzee argued, but she didn't get far. She was threatened and tethered anew. Eventually, the trio began to journey into town. Smart wore a veil, and they went to restaurants and parties. She was ordered not to speak to anyone, and Mitchell kept her close. If anyone approached them, she said, he put his body between them. They ate at a salad bar, where a waitress noticed the robes and the new addition to the table, but didn't ask any questions. Once, when they ate at a Hard Rock Cafe, Smart said she scratched a plea for help into the paint of a bathroom stall. Mitchell began to speak of going to California for the winter, and in August they walked to the library for maps. Someone called the police, saying Elizabeth Smart might be at the library. The caller said he thought he recognized her eyes. Former Salt Lake City homicide detective Jon Richey was sent to investigate. Although he considered the lead "a long shot," he asked, repeatedly, to lift the young woman's veil. But Mitchell said it violated their religious beliefs for anyone but the young woman's husband to see her face. Richey testified that it would have violated her civil rights to lift the veil if the story about her religious beliefs was true. And Mitchell's calm demeanor didn't set off any alarms for him. He said that when he learned about six months later that the girl he'd tried to question was Smart, it left him "traumatized." "I don't see anything else I could have done," Richey told reporters after his testimony. "It's difficult for me, but I live with that, and there's nothing I would have done differently." Smart testified that as the detective left, "I felt like hope was walking out the door." She added, "I was so mad at myself. Mad at myself for not taking the chance. I felt like it was so close. I felt terrible that the detective could just walk away." He wouldn't be the last. But from that moment on, Smart testified, an additional veil shielded her eyes because, as Mitchell told her: "The world wasn't ready for that light in my eyes." The close call hastened Mitchell's resolve to travel to California, where the bearded man and two veiled women were hard to miss as they walked "like ducks in a row" along the streets of Lakeside. The girl caught retired police officer Jill Ogilvie's eye. She seemed "out of place." The man glared at Ogilvie in a manner "so intimidating, so encompassing, it stopped me." She identified Mitchell as the glaring man. "And I looked at the girl," she said, "I looked at her eyes. Her eyes were blank. Just dead." Prosecutors say that girl was Smart, who arrived by Greyhound bus from Salt Lake City in early October. Ogilvie stopped a sheriff's deputy a couple of days later and got him to approach the three. "He only engaged the man for conversation," she recalled. "He did not address the woman at all. He wrote something down in his notebook and he left." She called the FBI, she said, but nothing happened. Frustrated, Ogilvie contacted the trio on her own, and the man put his hand up and spoke to her in a biblical way. "I turned to the girl and said. 'Are you OK?' and at that point in time her eyes were fearful," Olgivie said. "I had the impression I was getting her in trouble." She said the man had "a personality that is much larger than anyone I've ever encountered." He controlled the situation -- and scared her. "Literally by his demeanor, by his actions, he had stopped me mid-word." Adelia Harrington also noticed the three several times at the Lakeside branch of the San Diego public library, where she worked. "Boy, this teenager has really done something to make her parents angry with her, and they're just staying right on top of her," Harrington said she remembers thinking at the time. She described them as "just not a happy group." Mitchell spent a week in jail after tossing a brick through a church window. Smart and Barzee grew weak from hunger as they awaited his return at their makeshift mountainside camp. Mitchell used a false name when he appeared in a San Diego courtroom on February 18, 2003. He told the judge that he, his wife, and his daughter were staying with friends, and that he was a minister who had fallen off the wagon. "For the first time in 22 years, I got drunk that night," he told the judge, promising to turn his life around. Yet another close call gave Mitchell the urge to move on. Smart convinced him to hitchhike back to Utah, saying God had suggested it to her in a revelation. Trevelin Colianni, a disabled Navy veteran, saw them at a Burger King in Las Vegas, Nevada. The teenager "had kind of a grayish wig on and a scarf around it, sunglasses, and a look that I'll never forget," he said. "She was very frightened, very nervous." The man had a hold on the young woman's wrist and led her around. "She never looked like she moved on her own," he recalled. He told his wife, "Something's not right" and called police, unable to get over "the look in that little girl's face." In Session's Lena Jakobsson contributed to this story.